Pensacola, Fla .(Nov. 21, 2018) – Visit Pensacola celebrated the beginning of the holiday season by unveiling a highly anticipated holiday surprise, an eight-foot holiday cube in Plaza de Luna in Downtown Pensacola. 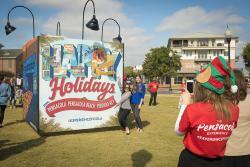 The Holiday Cube depicts different Pensacola experiences aimed to encompass the entire area. On one side, Santa’s sleigh is being drawn by the U.S. Navy Blue Angels flying high over the Pensacola Beach Pier. On another, a typographic representation of the Graffiti Bridge takes people on a journey through an artistic portal encouraging readers to say yes to new adventures. A third side showcases Perdido Key and Big Lagoon State Park complete with interactive pelican wings. The fourth panel is a larger than life holiday postcard that has Pensacola staples drawn into the lettering. The Holiday Cube will be set up in Plaza de Luna from now until Wednesday, Jan. 2, 2019, and will be lit at night so that it is visible. For more information on the Visit Pensacola Holiday Cube, visit visitpensacola.com/holidaycube.